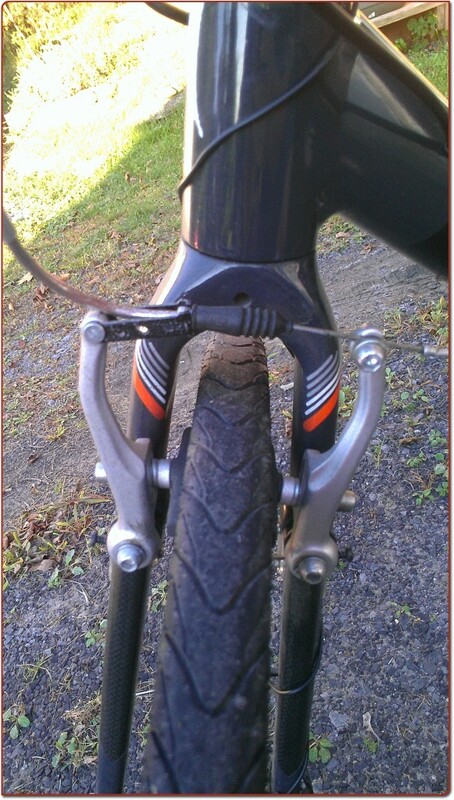 I like my bike brakes to be nice and grippy—I want to be able to stop quickly when I need to, even if I’m going fast. 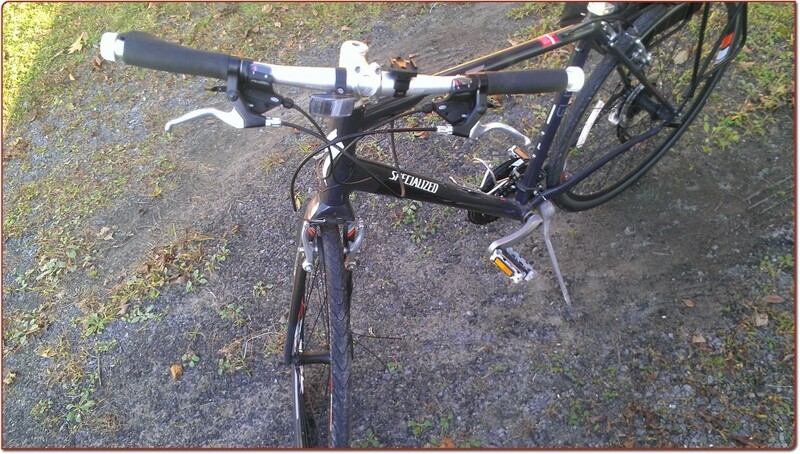 I want the braking to start almost as soon as I touch the brake lever, but most bike brakes are set way too “soft” for me. My local bike shop charges $15 to adjust both brakes… Here’s how to fix them yourself, the easy way. Here’s the video first; the pictures and description follow. Pull lever. What your hand goes on. Pull to operate the brake. Cable (hidden) and cable housing. Connects the pull lever to the brake calipers. Brake calipers. These clamp together to squeeze brake pads (pieces of rubber, not shown) onto the wheel’s rim to stop the bike. Adjusting knob. 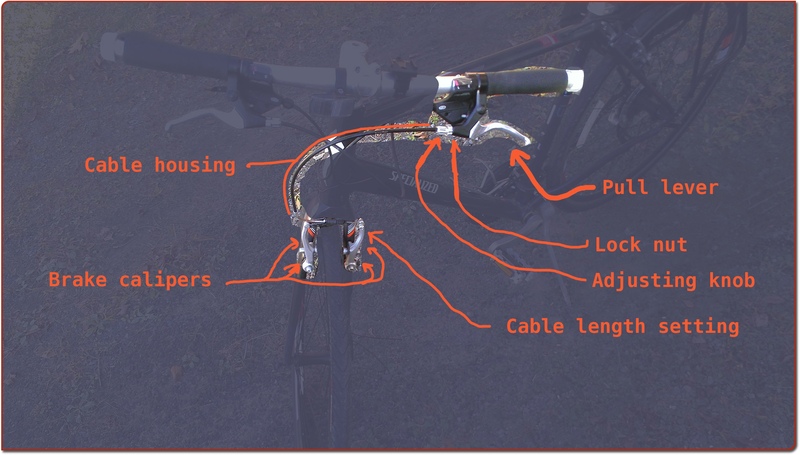 This allows you to adjust the length of the cable housing. Lock nut. Locks the position of the adjusting knob so it doesn’t go out of whack. Cable length setting. 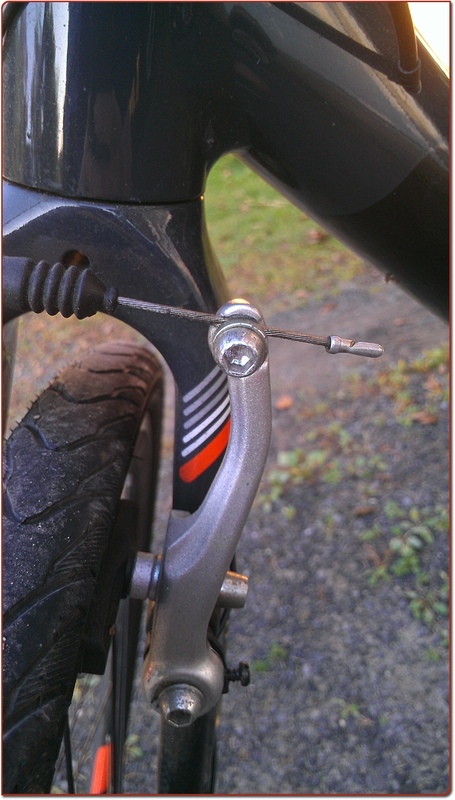 This is a screw or bolt that physically attaches the brake cable to the calipers. It can also be used to shorten or lengthen the cable, though that’s usually not necessary. I’m writing about standard caliper brakes, as used on most of the bikes I’ve seen in the last decade. If your bike’s brakes are different, this will probably still work, but your mileage might vary. Check to make sure that there’s still plenty of rubber on the brake pads, and that they’re aligned with the rims (they usually will be). If you need new brake pads, your local shop has them, or you can get them here. 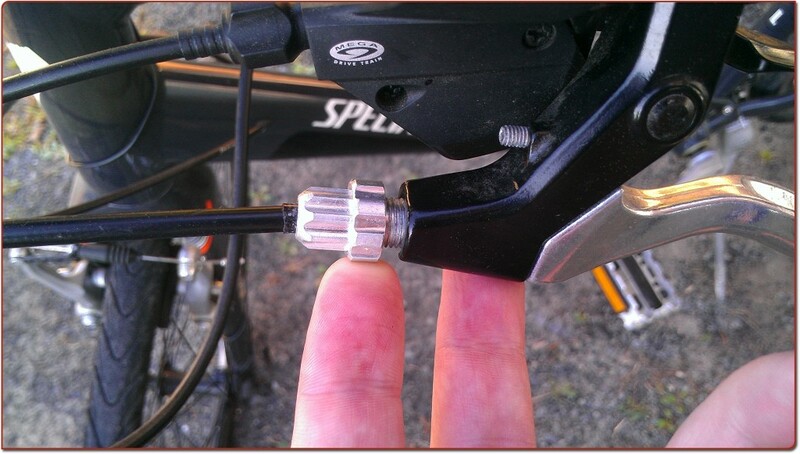 Also make sure the bolt on the cable length setting is fully tightened (it usually will be). One caveat: we’re going to mess with your brakes. Once you’re done, make sure that you test them carefully by spinning the wheels in the air and squeezing the pulls, to make sure they’re functioning properly. Do this before you get on the bike. Seriously. For me, that’s a good compromise that gives me plenty of braking power and speed while still making sure the brakes don’t engage when I’m just riding along. We’re not actually going to adjust the brake cable’s length. We’re going to adjust the housing’s length, which ends up having the same effect: make the housing longer, the cable becomes (relatively) shorter. 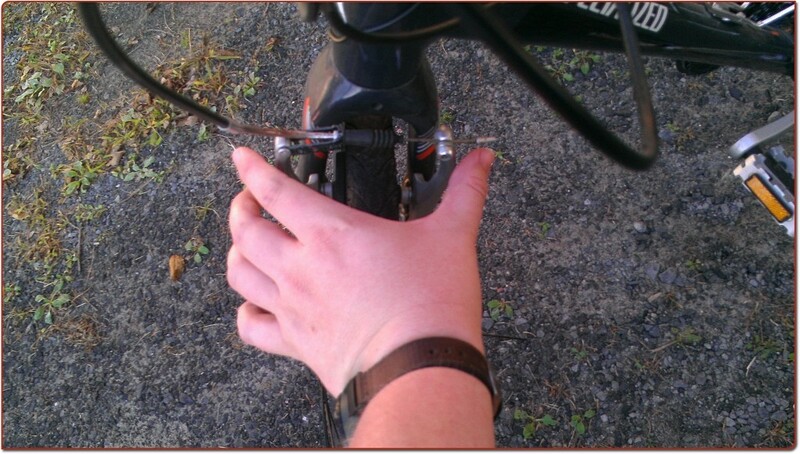 Make the brakes as tight as they can go, so that they’re fully engaged when the lever is in resting position. Back off from that position until you hit a comfortable balance where the brake is normally off but still quick and grippy to use. The advantage of this approach is that you only make the adjustment once, and then you’re done. Other ways I’ve been taught to adjust brakes involve doing a lot of “make a small change, then test it. Now make another small change, then test it.” That eats time. I’m going to demonstrate on my bike’s front brakes, but the principle is the same for the back brakes. The lock nut is the one closer to the lever pull, and all it does is hold the adjustment knob in place. Unscrew the lock nut as far as it can go. On my bike, that’s what you see above. And squeeze inward so that the calipers close and the brake pads come to rest on the wheel rims. If you have a friend to help hold the calipers closed, that makes it a little easier, but you can do it by yourself with no problems. Turn the adjustment knob counter-clockwise until its threads are just about to disengage from the brake pull assembly. This puts the cable housing in its longest-available position. Now try the brake pull. Do the brakes engage where you like? If so, great! 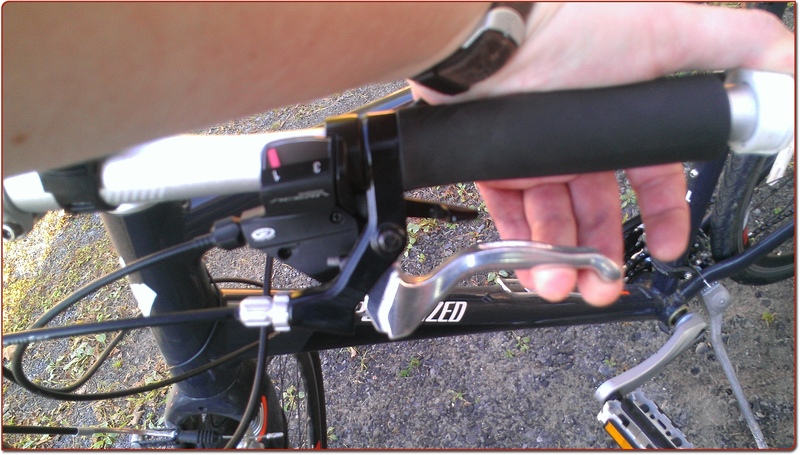 If the brakes engage too soon, keep gentle pressure on the brake lever as you screw the adjustment knob back in. 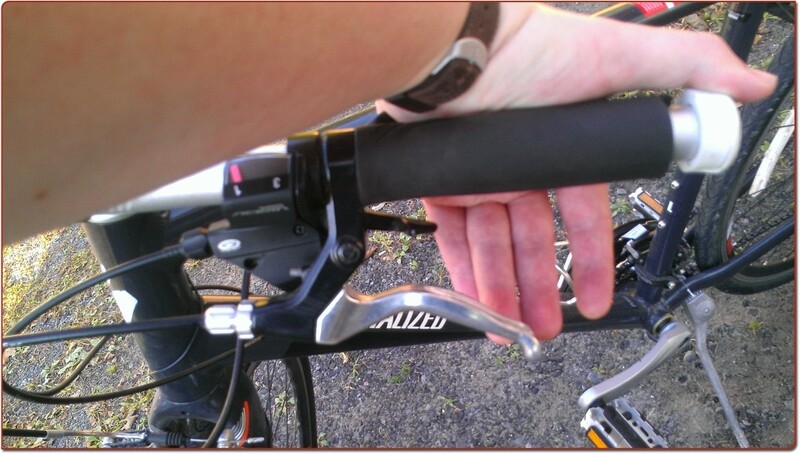 Stop once the brake lever is in the spot you want. 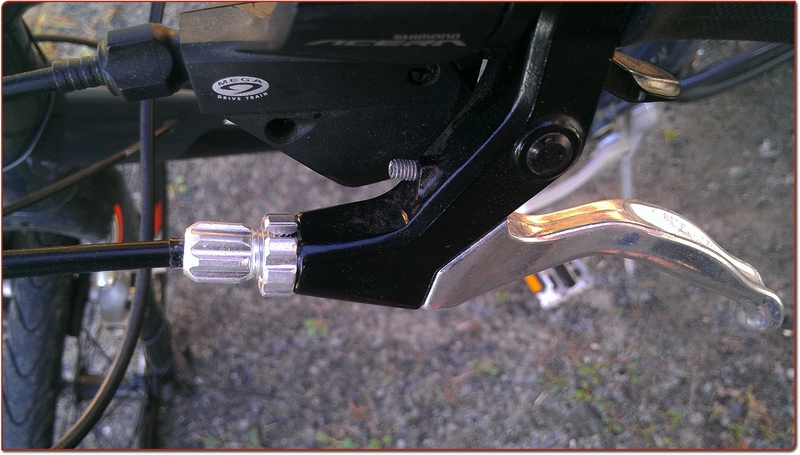 If you do adjust that screw, test it rigorously before riding: if the cable slips, you don’t have any brakes. Once you’ve got the lever working the way you want, screw the lock nut down (clockwise) to lock the assembly into position. Lift the bike so the front wheel is off the ground, then give it a good spin. Listen and look to make sure that the brake pads aren’t hitting the rim. If they are, you need to redo the process and screw the adjustment knob in a little more. Give the wheel another spin and pull the brake lever. The wheel should stop quickly. Assuming it does, give it a riding test. If it’s not working, use the other brake to stop, then go back through the process and make adjustments. If this was useful to you, I’d be grateful if you’d send me a buck or two (via PayPal) to help keep this site available for everyone. My local bike shop charges $15 to adjust both brakes, and you can now do it for yourself, for free, forever. Donation is quick, easy, and secure–just use the button below. Thanks so much for your generosity, and have fun riding! Do you know how to adjust the little black screws on the side of the brake calipers? They are supposed to set the tension that pushes the arms away from the rim. My brakes lock and hug the rims fine, they just don’t open back up. Good question! I’m not at my bike right now, but I’m wondering about a lubrication issue. Any chance that there’s some corrosion or gunk on the bearing surfaces where the calipers meet the frame? Also, have you inspected the spring to make sure it isn’t broken? hey thanks man, havent messed with a bike since i was a kid. just finished changing my back tube w/o quick release… no probs. 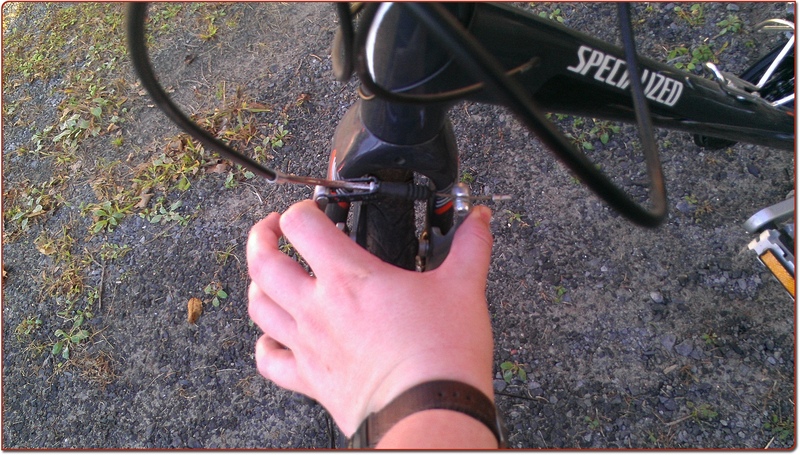 Your pics and description are totally helpful in the brake adjustment process. ty! !